Send 1 face-up monster you control to the GY; apply the following effect, depending on the Type of monster sent. This card's Japanese name is a pun between roars and roses, reflecting in the kanji's meaning Fragrance Embrace of Frozen Roses. 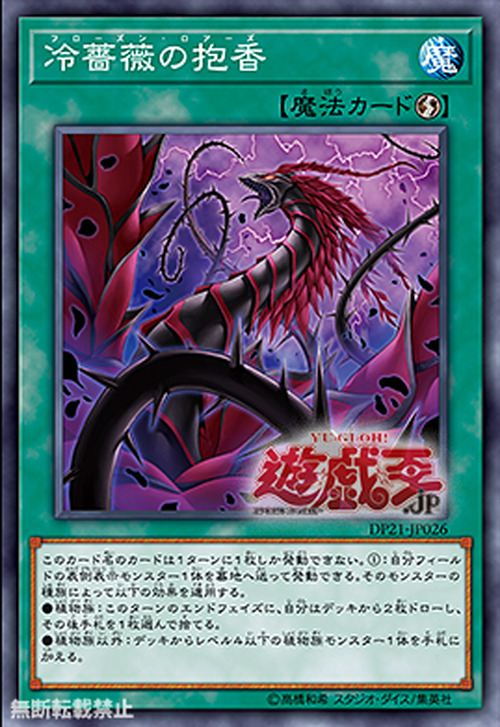 “Black Rose Dragon” appears in this card’s artwork. This card’s two effects recreate a card that has been on the Forbidden/Limited list, the first effect being a slightly weaker “Graceful Charity” and the second one being a plant type searcher like “Reinforcement of the Army”.